Used for waterproof works on the basement, roof and ground of industrial and civil architecture, especially for subway, tunnel and waterproof project constructed in rainy season. The construction surface can be concrete / steel / wood / plastic / glass and etc. 1. Shall not damage the sheet with steel or hard objects. 2. Shall strengthen waterproof layer protection when tie steel or pour concrete. 3. Shall not construct on the base with pollution, water, ice.oil..
4. Joint lap should be pressed well. It has good waterproofing and ageing-resistance function, not flowing at highest temperature and no crack at lowest temperature; Easy application, no pollution, and long service life etc. 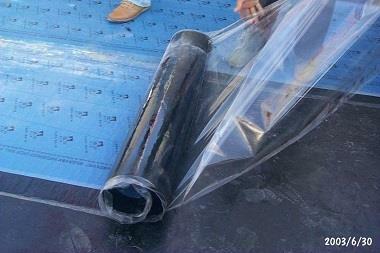 Should you have any preference for the hdpe self adhesive bitumen waterproof membrane for underground, welcome to contact us for the product made in China. As a leading such manufacturer in China, we are equipped with a professional factory at your service, and we will offer you the most competitive price.